Of all the women of Europe, the Albanians have traditionally been the most disadvantaged. 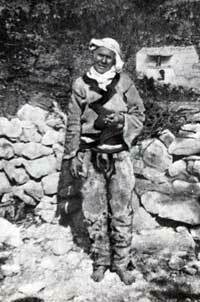 Even today, despite some emancipation in the communist period (one of the few positive things the communist regime in Albania ever did), they are still victims of staunchly patriarchal values, in particular in the countryside. 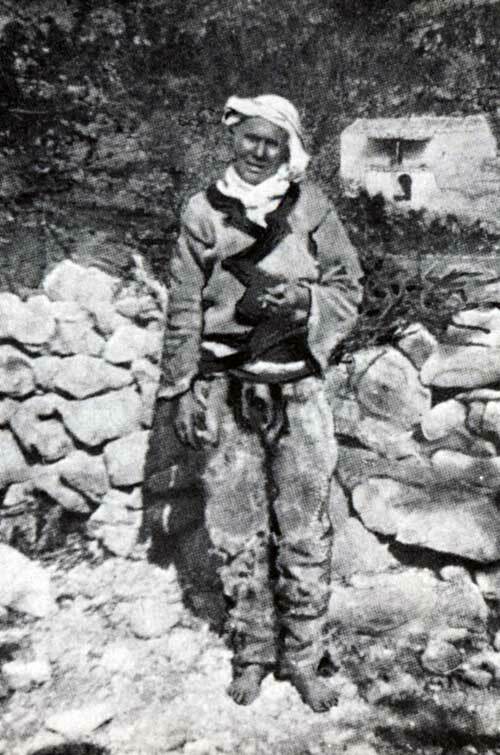 German journalist and author, Paul Siebertz (1877-1954), describes their lot as he experienced it on an expedition into the mountains of northern Albania in 1910. Siebertz was editor-in-chief of “Das Vaterland” (The Fatherland), “newspaper for the Austrian monarchy” in Vienna from 1907-1911, and was the author of several books. The low level of cultural advancement of the Albanian people can be seen more than anywhere else in the lack of standing of the female population. Women play a very subordinate role in public and private life among the Albanians. As Baron Nopcsa has rightly noted, women in Albania are inviolable, as elsewhere in Turkey, but this should not be interpreted as a sign of respect but rather as a sign of disrespect. A woman will never be accused of or punished for an offence. She can go out wherever she wants without fear, even if her family is involved in a blood feud but only because it is regarded as shameful to take revenge on a woman. What Albanian men expect of their women is that they fetch wood, cook the meals, bake bread and make clothes. They use the women to carry goods when their packhorses and mules are ill or not available. Women do all the hard work in this country. “Since children are engaged to one another at a very early age,” writes Baron Nopcsa, “love is something quite unknown. This can be seen in the fact that a widower will lament the loss of his wife, but not as a companion. What he usually misses is the housewife as a servant.” It is interesting to note that the Albanian language has no word for “love” or “to love”. As a rule, women first meet their husbands on the day they get married because engagements are always arranged by the parents. It is only among the highland Albanians, among the rugged mountain tribes, that one occasionally encounters love matches because there is less communication. But here, too, getting to know one another before marriage is extremely difficult because most of the tribes disapprove of marriage within the tribe itself. The husband and wife must be of different tribes because members of one tribe see themselves as blood relations descending from one ancestor, and marriage with a blood relation, however distant, is regarded as incestuous. An illustration of this is the following occurrence described by Karl Steinmetz that took place in Nikaj. 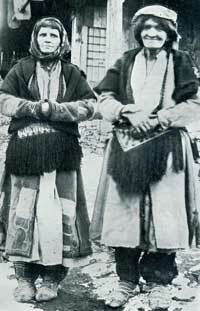 A Nikaj man was engaged to a Shoshi girl, but the prospective bride fled to her married sister in Shala shortly before the marriage. Her brother, as head of the household, was in a very difficult situation because the groom was demanding his bride and non-fulfillment of the engagement would have led to a blood feud. To solve the problem, he seized the married sister from Shala who was on a visit to her family and gave her to the fellow from Nikaj instead of the younger sister who had run away. The groom was satisfied with this situation because he had not seen either of the girls before. The problem was thus solved. However, the woman later escaped and returned to her original husband, and the Nikaj fellow was shot by the men of Shala when he attempted to get her back. In the rare cases of love matches in the highlands, the young man has already visited the household of the girl and has seen her. He then sends his mother or another relative with a present for the father of the girl he is interested in. Should the father accept the gift, it is a sign that he has no objection to the relationship. If the father refuses, but the girl agrees, she is then kidnapped by the young man and his friends. He is then, however, subject to a feud with her family. According to Steinmetz, girls are often kidnapped willingly. The bride receives no dowry. It is rather the duty of the young man, before the wedding, to pay the bride’s family, in accordance with his financial means, 1000 to 1500 piastres (220 to 300 Austrian crowns), and in some cases up to 3000 piastres (700 crowns). The bride is thus actually purchased, as Carl Patsch notes in detail in his study on the Sandjak of Berat. In my chapter on Albanian costumes, I noted that unmarried women can be distinguished from married women in that the former do not wear the colour red, even though their clothes are otherwise the same. 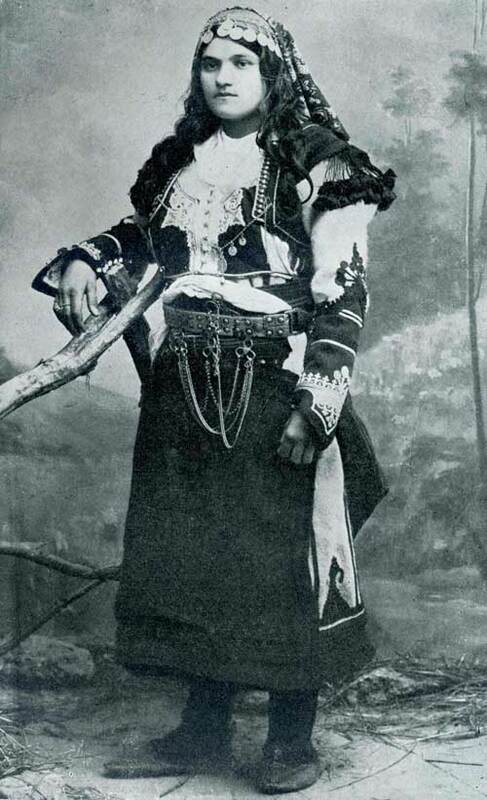 Scholars have given extremely varying views on the external appearance of Albanian women. Steinmetz asserts that there are quite a few attractive though peasanty faces among the highland women, as they are in our country. Baron Nopcsa, on the other hand, who is less chivalrous but probably more truthful, insists: “Early marriages and hard work have helped transform the generally plain physiognomy of Albanian women into hideousness within a very short time. Even more or less pleasant female faces are extremely rare.” However, as Baron Nopcsa stresses to be fair, the clothes the women wear make an unfavourable impression. They could be described as plump and tasteless. It is to be noted that Albanian women, even the Muslims, are unveiled when they go outside and make no effort to turn away or to hide their faces and hands from the view of foreigners. It is extremely rare for an Albanian woman to sit down at a meal with male guests. In Muslim homes, the women are in another room with the children and male guests rarely even see them. Otherwise, the provisions of the Koran are not taken too seriously by Muslim Albanian women; at any rate they are not followed. Women accompany their men to battle, but serve more as bearers of weapons and goods than as equal spouses. Women are used for negotiation purposes. They also bury the dead and tend to the wounded. There are reports that during periods of intense and bitter fighting between Albanians and Montenegrins, women have been killed – most likely by stray bullets. Every Albanian is obliged to get married. There are thus very few unmarried girls. It does, however, occur from time to time that girls will refuse the yoke of marriage or are unable to marry for family reasons. They then go to church and state solemnly that they will never marry. In this manner, they acquire all the privileges of men and, from this moment on, they wear male clothes and bear arms. These girls, called Sworn Virgins, are under the protection of the church. Many of them struggle to cope with the farms they inherit from their fathers. Some of them are much sought after as singers and travel freely around the country singing native heroic songs. It often occurs that girls declare themselves to be Sworn Virgins in order to save family property from relatives when there are no direct male heirs in the family itself. In addition, this ‘change of gender” is the only way out for a girl wishing to get out of an unwanted engagement without subjecting her family to the bloody revenge of a rejected groom. Johann Georg von Hahn tells us of the most famous of these Sworn Virgins, Marla of Perlataj, whose uncle engaged her to a Turk from Luria when she was a small child. When Marla turned seventeen and the Turk wanted to have her, she went before the council of elders in her village and declared that the Turk would force his religion upon her. To save her soul, she wanted to become a man. She demanded her father’s arms from her uncle and bore them until her death as ‘Peter of Perlataj.’ Another Albanian girl, Marçala of Lassa was in love with a young man who, however, had been engaged as a little boy to someone else. When the young man was forced to marry his fiancée so as not to cause a blood feud with her family, Marçala “changed her gender” and was from then on called Gjin.